Chloe and Jane are a daughter and mother whose already tense relationship is put under considerable stress when they go on holiday to a remote location. Like lambs to the slaughter, an escalating series of shocking incidents leads Chloe and Jane into a violent and unexpected situation they could never have anticipated. In a remote section of Scotland, an old woman is bludgeoned to death by her husband. Within seconds, he too is killed by an unseen assassin. Making matters more complicated are a family compromised of a sour mother, her ineffectual boyfriend, a rebellious daughter, and a disconnected son. They are arriving to visit the dead lady, unaware of what has happened. When they get to the isolated spot, all they find is a couple of their friends, a unsettlingly quiet manor, and a handyman who looks like a deranged psychopath. Surprise - he is! Within minutes, he is slicing and dicing his way through the countryside, righting wrongs that only exist in his pointed little head. From a nosy entomologist who experiments on bugs to a psychic who seems stuck in stupor mode, no one is safe. The film won him the Best Directing in a HD Feature Award at the 2009 HD Fest, but has attracted distinctly mixed reviews, and what I mean by that is mixed feelings within the same review. 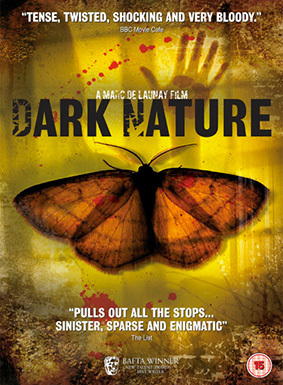 You can check out for yourself when Dark Nature is released on UK DVD on 31st December 2012 by Matchbox Films at the RRP of £15.99.